Most of us have rechargeable razors, tools, flashlights, radio's, etc, that can take up to 12 hours to recharge from a transformer that plugs into a wall socket (110 VAC) and converts the electricity to DC of the correct voltage. In theory, we could use a 12 volt DC battery and an inverter to make 110 VAC electricity, then plug in the transformer and charge the appliance. But there is a fly in the ointment: most inverter's DO NOT like to have transformers directly connected to them, and the owner's manual makes that perfectly clear. So now what do we do? What is needed is a universal DC-to-DC adaptor. These units (such as the Radio Shack #273-1662, at $12.99) do the trick. They plug into a cigarette lighter socket (12 VDC) and have a variety of voltage outputs (3, 4.5, 6, 7.5, 9, etc), and the polarity of the adaptor plugs can be reversed (A blessing or a curse, depending upon if you are careful or not). Using a multi meter set on DC, with the red prong set in the middle and the black prong touching the side of the outlet plug, the actual voltage output can be easily measured. If the voltage registered is negative (-) or not showing, you have the polarity reversed, so just reverse the plug on its little pins. A DC-to-DC adaptor replaces the little transformer that plugs into a 110 VAC outlet, and plugs directly into the appliance (or its charging base). The tricky part is determining the correct voltage and polarity required by each tool. Sometimes the tool itself will have the correct symbols molded in near the socket, and at other times one must check the transformer for a particular appliance. My Craftsman cordless screwdriver has no markings on either the tool or the base/holder. The transformer, however, indicates an output of 6 VDC with the center of the plug positive (+). A Sanyo mini cassette recorder shows an input on the recorder of 3 VDC with a center positive (+). A BayGen hand cranked radio will accept from 3 to 9 VDC, center positive (+). A BayGen hand crank flashlight requires 12 volt input with center positive (+). Of the four items mentioned above, two of them will work perfectly with a DC-to-DC adaptor set on 6 volts, center positive, and the other two with merely a flip of the power selection switch. The only exceptions I have found to the center positive plug position is with some Sony appliances, and they are clearly marked. So, if you have a universal DC-to-DC adaptor, all is well with the world, right? Not necessarily. They depend upon the battery in a vehicle and where a cigarette lighter plug is generally found being charged. As long as fuel is available and driving possible, the battery in a vehicle will not be harmed by continuous use in charging rechargeable appliances, as the current draw is only 500 mA or so virtually negligible. But what if gasoline for the vehicle is not available? Then one can use a 12 volt RV battery as the reservoir to charge rechargeable appliances. Even "dirty" power can be used with a 110 VAC battery charger and keep an RV battery charged. But even "dirty" power may not be available. A 5 watt solar panel can charge the battery. (Personally, I have absolutely no plans to take any solar charger out of their Faraday cages until the Solar Maximum). A fan blade ripped of a large air circulation fan can be hooked up to a small generator using a jack shaft and fan belts, making a crude wind mill. Think creative and don't worry about people laughing at you. OK so far? With a DC-to-DC adaptor, you can keep most rechargeable appliances charged and working - if you can plug the adaptor into a cigarette lighter socket. But a 12 VDC RV battery does not come with a lighter socket! I built my own universal lighter socket, and it was easy. 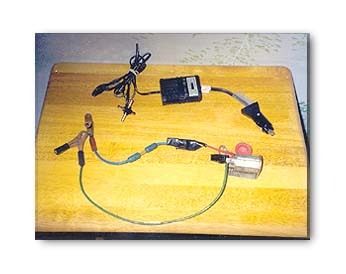 The parts required are an external cigarette lighter socket; a 12 gauge wire with a 20 amp fuse in-line; a separate 12 gauge, braided, insulated wire about 11/2' ft long; and two medium-sized alligator clamps (one red, one black). These parts are available at any reasonably stocked auto parts store. The wire with the in-line fuse generally comes in a loop, so the loop is cut in the middle of the wire, with the fuse ending up in the middle. The fused wire has a red (+) alligator clamp attached to one end, and the other end is attached to the CENTER of the external cigarette lighter socket. The other wire has a black-handled alligator clamp ( - ) attached to one end, and the other end attached to the fitting on the outside of the lighter socket. The socket is wrapped with black electrical tape when completed. The little device just described (see below illustration, bottom device) can be clipped onto an RV battery's terminals: positive (+ red) first, black ( - negative) second, and it is ready for use. In fact, it can be used concurrently with an inverter's leads attached to the same battery.